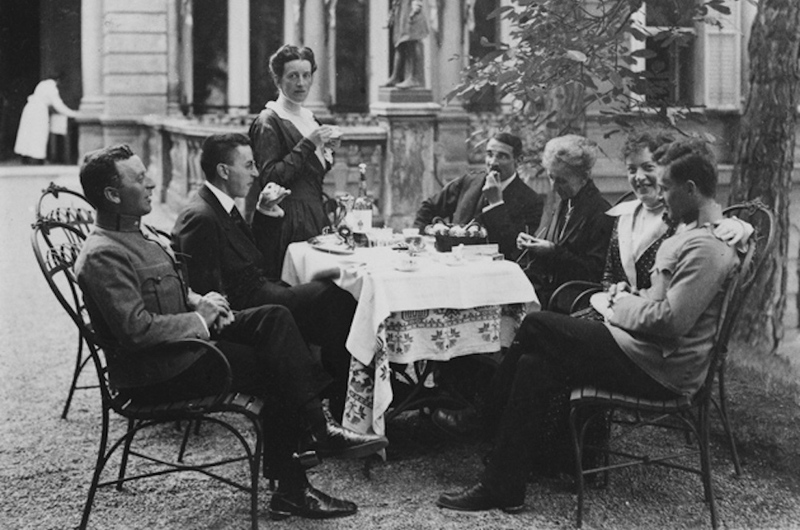 The Wittgenstein family in Vienna, 1917. Ludwig is seated at far right. Photo courtesy of Wikimedia Commons. Language doesn’t point to reality, Wittgenstein came to believe, but is part of reality itself. And, in practice, it functions like a game—if you’re not in-the-know about its rules, you can’t play along. Wittgenstein ultimately came to contend that language functions by an agreed-upon “network of rules,” and that words derive their meaning from social agreement about what they mean. That social agreement can be fuzzy at times, but there is at least some general consensus about what any given word means—and, just as importantly, how any given word should be used. Language to Wittgenstein, then, is not just a semantic word game but it drives how we judge one another and ourselves, and hence it determines our values and our conduct as individuals and a society. He held that the language game at its best continually enhances our capacities for judgment, and in ways that drive the cultivation and evolution of the underlying norms of decency, civility, understanding, empathy, and citizenship that are the bedrock of an open society. But what if someone, or a group of someones, seeks to subvert the rules of the language game in a blatant attempt to undermine these norms? What if someone tries to use language as a principal means to create a dark and sinister reality? Wittgenstein didn’t reach an answer to such questions naturally, or easily. He spent his life steering clear of writing about politics, or political theory. But he lived and worked amid the horrors of a world war sparked by a Nazi ideology that used language to classify entire groups of people as subhuman, so as to justify annihilating them. And so he gave us answers that should guide our thinking about language today. Wittgenstein started by dispelling any and all notions of language’s permanence and fixity. Since language is an ever-changing game, it can just as easily devolve as evolve. And in the worst cases, language can degenerate into xenophobia, jingoism, and violent ultra-nationalism. By Wittgenstein’s take, then, language games do not ipso facto cohere in any sort of permanent or predictable way or pattern; rather, it’s up to us to see to it, among competing language games, that the ones that win the day are composed of what he calls “signposts” and “family resemblances” that feature an uplifting politics. To him, it’s a matter of individual and societal choice whether we fasten on to a “stream of language” that makes us more understanding, reasonable, connected, and committed to one another. The speeches of Hitler, for instance, demonstrate how the Führer used “low language”—simple sentences that are understood and appeal even to someone with little or no education—to bring down the curtain on Germany’s open society, which had been one of the most cultured civilizations in human history, and on European society in general. Hitler in effect created a coherent new language steeped in anti-Semitism. And this, in turn, flipped an entire flourishing culture on its head. Although Wittgenstein did not extrapolate from his own dark times to the future, he would be the first to underscore how the contemporary spread and growing sophistication of mass media, propaganda, political speech, and even advertising can pervert the way that language is constructed, deployed, and manipulated. “If language is to be a means of communication” worth its salt, he held, there must be sound judgment and shared agreement in the “form of life” we hope to realize. This requires an elevating set of shared norms. Mass culture and communications, Wittgenstein believed, might well provide fertile ground for creating new modes and means for innovative perspectives and unconventional hypotheses in the use of ordinary speech. But all too often it gives rise to its converse. Is there a way out of this language game morass? One of the ways Wittgenstein hoped that people could change their language, and thus change the world, was by the more expansive use of metaphors. Expanding the language of our shared experience by employing comparative metaphors, he felt, could humanize discussions that were being deliberately dehumanized. Since language is an ever-changing game, it can just as easily devolve as evolve. And in the worst cases, language can degenerate into xenophobia, jingoism, and violent ultra-nationalism. This is why I often think of Wittgenstein—who has a reputation as one of the most cerebral of 20th-century philosophers—when I’m working with kids. Once, when I was philosophizing with a group of four-year-olds at a daycare center, I blew a bubble into the air that made a brief zigzag trajectory and then popped. I asked the kids, “What happens to the bubbled after it pops?” One boy promptly replied, “The same thing that happened to my grandmother. When she died, her soul popped.” With that metaphor, connecting the experience of the bubble popping, the loss of his grandmother, and a four-year-old’s conception of the soul, language, connection, and even culture are renewed. A good metaphor allows us to see the world from another’s unique perspective, and in doing that, we can acknowledge what we share. Wittgenstein, who insisted that “philosophy is not a theory but an activity,” construed his lifelong professional aim as furthering “the understanding that consists in ‘seeing connections,’” both of the metaphorical and literal variety. For him, as for our children, it isn’t enough simply to come up with “shared agreement” on forms of living and acting in the world. Instead, the world needs the kinds of shared agreements that make people more connected, and more adept and intent on making conscientious judgments. The language that builds those bridges, Wittgenstein would surely maintain, is our only chance to veer away from barbarism and steer our way back toward a humanism without borders. Christopher Phillips is the founder and Executive Director of the nonprofit Democracy Café, and the author of works including Constitution Café: Jefferson’s Brew for a True Revolution, and Socrates Café: A Fresh Taste of Philosophy. His newest book is The Philosophy of Childing: Unlocking Creativity, Curiosity and Reason through the Wisdom of Our Youngest.